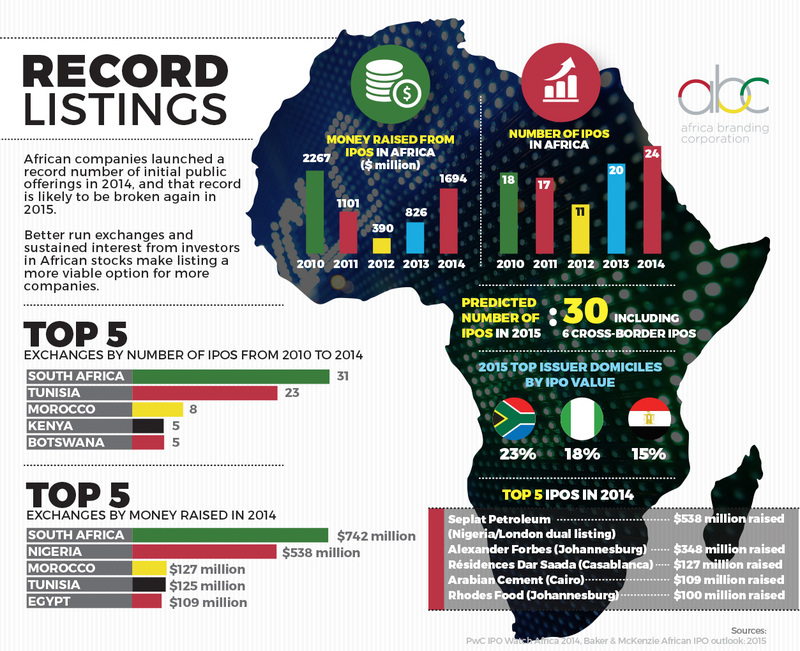 Investors enjoyed a record year for initial public offerings on African bourses in 2014. Last year, 24 companies listed on bourses from Tunisia to South Africa, raising $1.7 billion, up from $0.8 billion in 2013. This year 30 firms are planning to list. The 24 IPOs in 2014 represented a 33 percent increase over the 2013 deal volume, driven partly by improved regulation and corporate governance across the continent. Private equity exits combined with increasingly stable local stock markets drove IPO activity in 2014, and will likely do so in 2015. In January, international law firm Baker & McKenzie said that if all the companies that plan to list on stock exchanges do so, 2015 will break that record for volume of African listings. More exchanges and stronger exchanges explain the rise in IPOs. Two decades ago, Africa had just two bourses. There are now more than 25. However, the small number of listed companies and the dominance of larger listed corporations, combined with bourses’ historical lack of transparency and inefficiency, have suppressed the number of potential listings in Africa. Investors seek high liquidity, good governance and good oversight of exchanges and industries – criteria that remain difficult to meet. For companies, concerns over the cost of listing and ceding control have held them back from accessing public markets. In countries where political stability is better established, economic policy better managed and accountable institutions in place, investors can take advantage of Africa’s more liquid exchanges. In countries where political stability is better established, economic policy better managed and accountable institutions in place, investors can take advantage of Africa’s more liquid exchanges, such as Egypt’s EGX and South Africa’s JSE, and companies are more incentivized to list. The increasing number of IPOs in 2014 and 2015 testifies to the improving quality of African exchanges, as well as international investors’ continued interest in building up diversified African portfolios. To counter the lack of liquidity in some exchanges and attract more capital, regional integration is a developing theme in African financial markets. Nigeria’s NSE lists more than 200 companies, but almost a third of its value is represented by one company, the Dangote Group. Rwanda’s economy has attracted high investment inflows because of its strong regulatory structures, but its relatively young RSE stock exchange lists only five companies. UNCTAD’s Economic Development in Africa Report 2014 states: “Given the small size of African economies, capital market development will be more effective in channeling savings into long-term investments if it is done at the continental or regional level.” Two key developments are making regional integration a reality. In East Africa, a capital market harmonization initiative encompasses the stock markets of Kenya, Uganda, Tanzania, Rwanda and Burundi, and is due to be completed in June. West African exchanges (including Nigeria’s NSE, Ghana’s GSE, Sierra Leone’s SSE and the already-regional BVRM) are discussing the formation of a harmonized listing and trading platform that would create an integrated profile of around 300 companies. Africa already has two regional exchanges, the West African BVRM, based in Abidjan, and the Central African BVMAC, based in Gabon. Larger, more liquid and better-run stock exchanges serve to further satisfy the appetite for investing in Africa’s corporate growth, and are likely to spur even more IPO activity from African domiciled firms. Strong bourses also have a very positive impact on economic development in emerging economies. Cross-border listings are predicted to be a feature of 2015’s IPOs. Only one firm listed its shares abroad in 2014 (Seplat Petroleum in London and Lagos), but six are already planning to do so this year, meaning that they can access a larger international pool of capital, as well as tap into domestic funds. International investors have decried the lack of depth and liquidity in African markets in the past. Compared with other developing regions, Africa still lags behind significantly in listing volumes and values, but with bourses becoming more integrated and stable, and companies seeing more and more benefits to accessing public markets, investors will surely welcome the increasing number of IPO opportunities in 2015 and the years to come.